A POPULAR Darlington business is celebrating a milestone anniversary with a change of style. 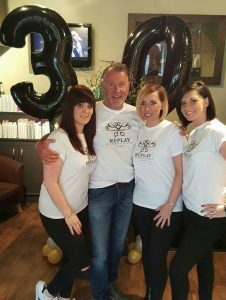 Hairdresser Paul Huitson marked 30 years of the Replay salon by handing over the reins to his loyal staff. As business’ pearl anniversary approached, Mr Huitson – who established the Houndgate business in 1986 – surprised staff by stepping down. The trio now in charge are Kerry Little, an employee for 25 years, Lynne Dimmick – an employee for 20 years – and Samantha Dennison, who has ten years of service. Ms Dennison said the 30th anniversary was testament to the team’s devotion to customer care, adding: “It’s unusual for a salon to have had the same staff for so long but it proves we are passionate about its success. “We’re warm and friendly to our clients as we see them as extended family members.